Over the next century, ecosystems throughout the world will be responding to rapid changes in climate and rising levels of carbon dioxide, inorganic N and ozone. Because people depend on biological systems for water, food and other ecosystem services, predicting the range of responses to global change for various ecosystem types in different geographic locations is a high priority. 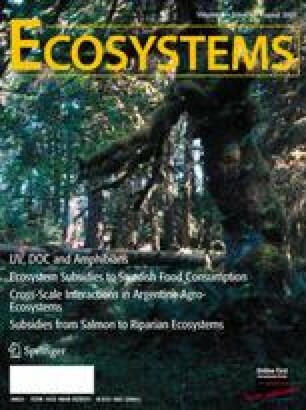 Modeling exercises and manipulative experimentation have been the principle approaches used to place upper and lower bounds on community and ecosystem responses. However, each of these approaches has recognized limitations. Manipulative experiments cannot vary all the relevant factors and are often performed at small spatio-temporal scales. Modeling is limited by data availability and by our knowledge of how current observations translate into future conditions. These weaknesses would improve if we could observe ecosystems that have already responded to global change factors and thus presage shifts in ecosystem structure and function. Here we consider whether urban forest remnants might offer this ability. As urban forests have been exposed to elevated temperature, carbon dioxide, nitrogen deposition and ozone for many decades, they may be ahead of the global change “response curve” for forests in their region. Therefore, not only might forests along urbanization gradients provide us with natural experiments for studying current responses to global change factors, but their legacy of response to past urbanization may also constitute space-for-time substitution experiments for predicting likely regional forest responses to continued environmental change. For this approach to be successful, appropriate criteria must be developed for selecting forest remnants and plots that would optimize our ability to detect incipient forest responses to spatial variation in global change factors along urbanization gradients, while minimizing artifacts associated with remnant size and factors other than those that simulate global change. Studying forests that meet such criteria along urban-to-rural gradients could become an informative part of a mixed strategy of approaches for improving forecasts of forest ecosystem change at the regional scale. We thank Mary Arthur, Jay Gulledge, Tara Trammell, Wei-Xing Zhu, Wayne Zipperer, Ann Kinzig and two anonymous reviewers for comments and suggestions on earlier drafts of this manuscript. This paper also benefited from stimulating discussions with Jay Gulledge as the manuscript evolved. We also thank Keith Mountain for expert piloting during aerial photography sessions. Funding from the University of Louisville Research Foundation is gratefully acknowledged. Tripler was supported on a National Science Foundation Minority Post-doctoral Fellowship (DBI-0208392).